MedPro Euro Drop Arm Commode by AMG securely accomodates patients weighing upto 350lbs. Its surface makes it eay to clean. Lift up arms can be be lifted up in a single motion for easy patient transfers. Can be used as a regular commode or as a sani-chair over the toilet seat. 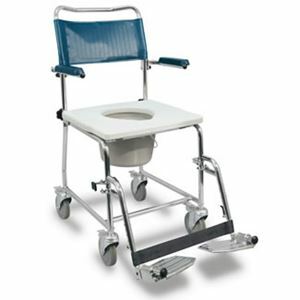 It features a water-resistant frame that helps the moisture to dry avoiding accidental slipping from the commode. Footrests can be attached or detached based on the need of the patients. Includes a bucket and a seat cover. Easy to assemble without the need of any tools. Cannot be used in a shower. Also availabe with seat for disposable bedpans.